There is a large adult male baboon on the loose in our neighborhood. He has been seen at the Dutch and Canadian embassies … If the baboon is spotted on or near our campus(es) during the school day we will go into “lock down” mode with a schoolwide alarm … If you see the baboon please call a principal or your supervisor immediately to tell us where he is! Well now that’s something different. This morning the lockdown alarm went off. An unscheduled lockdown in a school is a reason for deep concern. After battening the hatches, it took us a few minutes to put the pieces together while we hid out in the fiction section (along with a crew of grumpy parents, some teaching assistants, and a whole class of uncharacteristically silent 1st graders). An announcement came over the PA informing us that that bad boy had indeed shown his hairy face on ICS property. Out the high-set windows we could see a guard up in a tree. Then we heard loud scuffling on the roof. My colleague Martha, who had been reading a book to the kids, read a little louder. The secondary roof has skylights. A baboon crashing through the glass ceiling would have given me a story to dine out on for the rest of my life, but it might not have been so great from a first grader’s perspective. We secured the elementary library and moved in there. 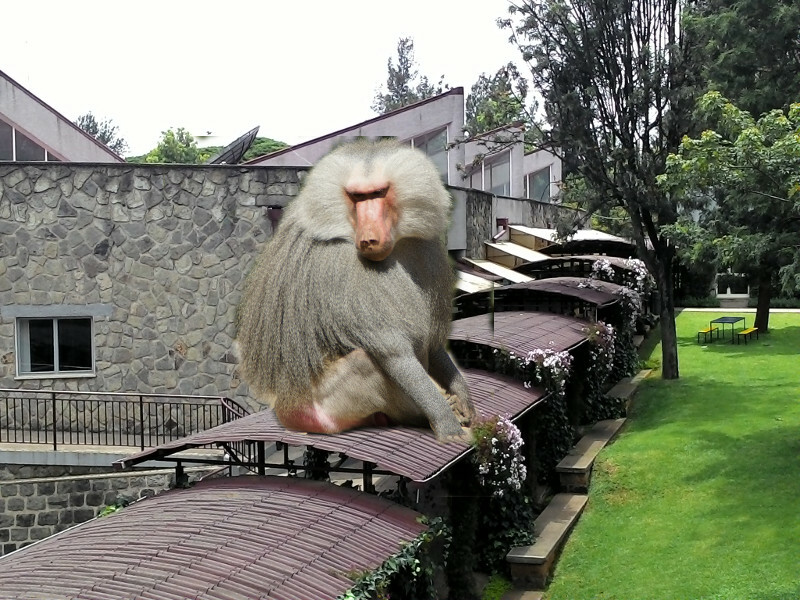 Be informed that the baboon has been cited [sic] on the library roof. Please continue your normal class and activities and KEEP DOORS LOCKED. We are in Lock down mode! I was a little bit worried about what the guards were going to do if they found the baboon. In addition to ICS guards, we have federal guards here who are armed with machine guns. But we also have our very own baboon whisperer, Mat Pines, on full time staff now (as a teacher, not a primate hostage negotiator, but still). I was pretty sure he wouldn’t let anyone hurt a baboon. Then a teacher told me that Mat’s wife is also experienced in these matters. She has tranquilizers and a blow dart gun, and she’d been tasked with sedating our simian intruder. But just when it seemed things might get really interesting, we got another message. Thank you all for your quick response. We have got a confirmation that the Baboon is no longer on campus. Everyone is advised to remain alert when going about your activities as the Baboon may be around the neighborhood. Free to roam another day. This entry was posted in Addis Ababa, Animals, International Community School and tagged baboon, lockdown. Bookmark the permalink. Lorna… Nathan Haines here. We’re doing a little history writing assignment about this baboon incident for TOK at ICS. Do you mind if students use your blog post as a source for the assignment? Haha! Sounds like a fun assignment, Nathan. Sure, it’s a public blog, they are free to use it (and I know you are teaching them to cite sources!) Just curious… what is the TOK purpose of the assignment? I’m interested in moving into TOK myself and looking for ideas.